Dear Aliya: How Do I Score A Celebrity Memoir Book Deal? an idea for a celebrity memoir but have no clue where to start. on (if you haven’t already) at some time in the future. I would be extremely grateful for any insight. management to see if they have interest in writing a book with you? together a book proposal and see if you can get a book deal? It’s interesting to receive this email. Because I’ve received several similar emails recently. And I’ve procrastinated on writing this post. Because the celeb memoir hustle is just that–a hustle. I like to encourage writers on my blog. I’m big on pushing us to ignore Toure and just keep writing and press on and all that good stuff. But if you’re interested in the celeb memoir game, all that goes out of the window. It’s not about how hard you work. It’s about who you know and a whole lot of dumb luck. Let me explain how I ended up writing Faith Evans’ book. It started with an assignment for Vibe magazine. In the summer of 2005, I interviewed her several times over the course of two weeks. I trailed her as she debuted her video for “Again” on 106 and Park. I went to her midtown-Manhattan hotel to continue the conversation. And then we had dinner–my first time ever having sushi–at some fancy spot called Matsuya. I liked Faith right away. We’re from the same ‘hood. She knows Aisha, the neighborhood bully who tried to beat up my cousin Allison over on Hansbury. She knows my boy Azziz from high school. And she knows my brother, who grew up with his mother just a few blocks away from Faith and the elderly couple who raised her. So we had that easy rapport with each other throughout the interview process. But it didn’t translate to any sort of connection after the story was published. Over a year later, I got an email in my Inbox. 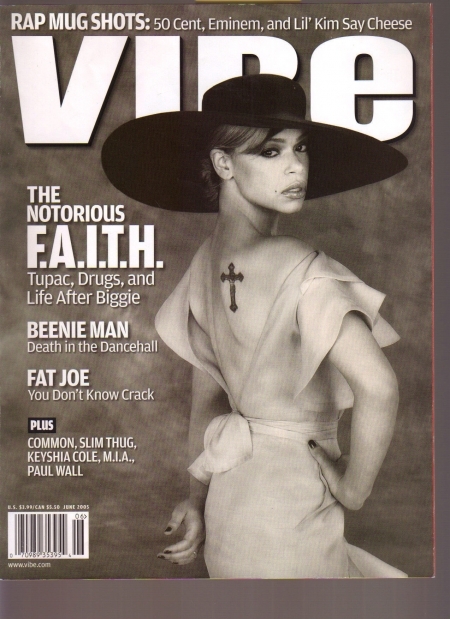 Hi Aliya, it’s Faith Evans. I hope all is well with you. Congrats on your marriage! I’m about to work on a book soon & I’ve been trying relentlessly to get some contact info on you. I was wondering if you’d be interested in collaborating on it with me. If this is your correct e-mail address, please respond with a contact #, so that we can speak soon. During the interview process, I asked Faith if I could interview family members or childhood friends for the story. She agreed. But I was pressed for time and had to end up using my own resources to track down some interviews. I drove over to the house where she grew up and knocked on the door. The man she calls her grandfather answered the door, dressed in a one-piece workman’s jumpsuit. I asked him if I could ask him a few questions. He let me in and we spoke briefly. I asked about his wife. She was teaching Sunday School up the street. I drove to the church. Wandered around the halls until I found her. She stepped out of her classroom and spoke to me. She told me about meeting Biggie at a family cookout and being shocked when Faye-Faye told her they were married. I added their quotes to my story. But I knew Faith probably wouldn’t appreciate that I’d gone out on my own and tracked them down. But obviously, my job is to get the story, not satisfy the artist. And then, I had to get some facts on the cocaine charges she’d recently faced. She and I had talked about it. But my editor wanted more. I wasn’t able to get much. But someone else at Vibe got a copy of the police report and quoted an officer for the story. The story turned out to be an objective, well-rounded profile. I was very proud. But it wasn’t the kind of story that a celebrity would like. I could see Faith reading it and rolling her eyes. I definitely didn’t expect her to reach out and talk about collaborating on a book. I put my agent in touch with her agent and they talked business and numbers. And then, it was done. I was officially Faith’s collaborator. I wrote her proposal. It was sent out and an auction was held to see who would publish the book. Sidebar: I wrote Faith’s proposal for no charge. This is common. After Faith’s book was published and did well, I was able to command a fee for the proposal process for the next projects. I have had people ask if they should insist on a fee for the proposal. The answer is complicated. For me, a fee for the proposal is insurance. If the book does not get picked up, you want to have something for your trouble. You have to gauge if it’s worth it to demand a fee for the proposal. And that was that. Faith and I worked on the book. Voila! It was published. I stood in line at Starbucks that summer and checked my Blackberry and saw this message. Keep The Faith is #21 on the New York Times Bestseller Non Fiction list for the week of September 21, 2008. This is great news because we haven’t even begun our “full court press” for publicity. But I couldn’t have made this happen. It just did. After the book was published, I started to field offers for other book deals. Faith’s agent picked up a new client–Frank Lucas–and asked me to meet with him. Frank interviewed a few writers and settled on me. Why? God only knows. If you have a relationship with the person and you can reach out to them directly, go for it. I feel like it’s kind of weird to approach someone and say, “Can I write your book.” But if you really feel like you have a good rapport and you already have a good relatioship, by all means, write them a note and explain what you want to do and your vision. If you don’t have a relationship with the person, I’m not sure if reaching out to management is helpful. My agent reaches out to other agents. But I wouldn’t reach out to management directly. They may not take you seriously. Yes, see above. If you and the subject agree on the terms, you put together a proposal and then shop the book deal to interested publishers. Hmmm. Good question. I don’t think so. Unless the record label is actually publishing the book, it’s a completely separate deal for the subject. Okay. So what should you do if you really want to get into the memoir-writing game? Even if you haven’t published a book yet, you can still get an agent. Put together your very best clips and send them out with a cover letter to potential agents. There are several agencies that are well-known for celebrity memoirs. Google. Find out who they are. Find out which agent handles the kinds of books you’d like to write. And send away. But please understand, the collaboration memoir gig is a crapshoot. It usually pays well, (when it actually pays). And it can be an awesome overall project. But honestly, it’s a tough gig to score. Have you any experience in the memoir-collaboration book game? Did I miss any important bits of advice? If you are interested in getting on and you have a specific question that I didn’t cover here, post in the comments and I’ll be sure to give you my thoughts. This entry was posted on July 30, 2009 at 11:20 am and is filed under Uncategorized. You can follow any responses to this entry through the RSS 2.0 feed. You can leave a response, or trackback from your own site. Thanks for ending the procrastination and posting this. I read Keep the Faith earlier this year and it really touched me (I have my own review on my blog). This post was interesting to me just as a reader, to learn the background on how you got the honor or writing Faith’s memoir. As a writer I am working on my own memoir and I am not necessarily looking to get in with a celebrity at this point. How long does it usually take you to write books with others? I find that with my busy life I often do not commit as much time to my writing as I should. Since this is my own memoir, I don’t have the excuse of having to track people down, and my only research is the umpteen journals I have hand-written for the past 20 years. I was just thinking of you and the F.E. event at Hue-Man last year. I hope your summer is going well, and that we can get together sometime in the fall! Also, I CANNOT WAIT for your novel to come out. I don’t know how I will survive until the pub date! @daree: I am a very fast writer. The interview process takes a long time. But the actual writing goes by fast for me. Then again, if I was writing my own memoir, it would be a much different story. It took me about three months to get Faith’s story down. A little longer for Frank Lucas. It’s harder to put my head in the mind of a 77 year old drug dealer from Harlem than it is a young girl from Newark who becomes a singer. Ha. God is so good! i was just gonna write you about this very topic. I really appreciate the advice and tips you provide on this website. @lakeiab: I do tape the interviews. But I also type as they talk. I can not transcribe all the hours of interview before I start writing. So I use the recordings as a backup. Mostly, I type right there as their talking and I’ve developed a sort of sloppy shorthand as I type. It’s full of misspellings because I’m going so fast to keep up with the flow of conversation. And sometimes, I have to say, “slow down,” which is a pain. But it’s better than just sitting back and talking and talking and recording. It would take me years to finish a book that way. So I have a working transcript with my sloppy typing after each conversation. if i need to go back and listen to the recording I do. Yes, I do use the subject’s voice. Which is hard sometimes. Frank Lucas played a lot of pool in Harlem in the early 40s. How the heck do I know what two men in 1944 Harlem say when their playing pool? I’ve never played pool in my life. That kind of stuff is hard sometimes. also sometimes feel too young to write someone’s memoir…going on 26 this year. Like they wouldn’t consider me for that reason. I dunno, is that rational? @clove: that’s just the thing, Clove. I do think it needs to be someone you have a rapport with. It’s such a personal thing. Faith saw something in me that she likes. And my clips had nothing to do with it. She just thought I would get her. And I did. From what I know, it seems like most writers jumped off in the game due to a story with an artist. Then they got an agent and moved on from there. But I do thing you (specifically) can sign on with an agent and get it popping that way. And I don’t think age is a factor as all. I’ve been really getting into your blog so thanks for sharing these precious pearls. I’m not nationally published, yet. However, after reading books on freelancing for magazines in general and your tips as someone who freelances with African American pubs specifically, I’m getting a great deal of info on how to focus. Now to my question. I read this post for future reference but, was curious about deceased celebrities. Of course for that, we can probably take out management and having a rapport with them. Would you need to have some type of connection with their family? Is it best to go through their family? I’m late as hell just finding out about your blog (shout out to The Cynical Ones), but I just wanted to congratulate you on a job well done with Faith Book. I knew I recognized the name on the cover, but couldn’t place where from. It was excellent and so hard to put down, I finished it in 2 days. Then I told half of gay Chicago to go get a copy, hahaha. I loves me some Faith and little did I know, I already loved me some Aliya :) Much love and success in the future! @Eunice: Apologies for missing your question! Deceased folks can be a lot easier. It’s great if you can get the family involved. But it’s not wholly necessary. You don’t need any permissions to tackle the life of the deceased. May make a stronger book if you have some connects in family. But it can be just as strong if you do tons of research on your own. All of gay Chicago! I love it!